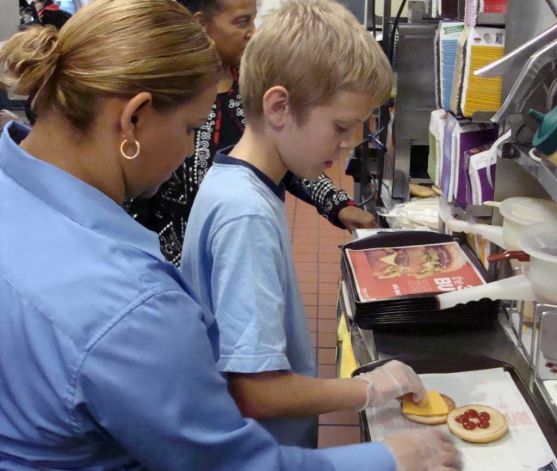 Weighty Matters: McDonald's Invited to Teach Nutrition to 5th Graders in Connecticut?! McDonald's Invited to Teach Nutrition to 5th Graders in Connecticut?! A ways back I blogged about how in Japan McDonald's was rolling out lesson plans for elementary students and in so doing, blatantly healthwashing their food. In my head I somehow figured that this was a practice unique to Japan, and that a program like it could never exist in North America. In what sounds like a carbon copy, the Connecticut Post reports on workshops conducted by McDonald's for Eli Whitney Elementary School's 5th and 6th graders. What are the kids being taught? "I learned that McDonald's can be very healthy for you if you make the right choices." "It was the best thing that ever happened to me." Not in so much as McDonald's is running this sort of a program, but rather that at least one school board and one set of school administrators think it's a good idea.